Discussion To the 200+ Guests online every day or so. To the 200+ Guests online every day or so. Please register a account and introduce yourself, no reason to stay in the dark. I welcome everyone to join the site, but the visitors are welcome to stay visitors if they wish. All that matters is that people can find solutions to their problems. I only registered so I could pose a few questions that I didn't find answers to searching the site. I had no idea I'd end up sticking around and even contributing once in awhile in my little small way! On most sites I'm just a "lurker," lol. Just an FYI, we've been noticing a great many guests recently. 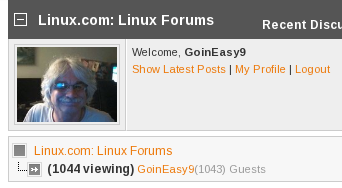 When you are in the home screen of the forum, check out the number of guests next to the names that are online. I spotted close to 500 the other night, though we've been averaging about 200. This is what this thread is about. BTW - Welcome back. Ok how about the 200th guest starting today wins a prize? Kill the mystery behind them all. lol. 341 Guests at present in main, was 241 when I signed in before, interesting. Could these be bots? Or maybe aliens searching for the one true kernel. Edit: In the time it took to write that, guests jumped to 464. If you are aliens, beam us up please. We are also searching for intelligent life in this universe. Edit: Wow 999 guests at 1:20am EST 07/17/11, now that's a record. I registered after reading this thread in all honesty...why not! right?!?! I guess I give in to peer pressure too often. Welcome aboard Sean. Well, that accounts for one of the Guests. I guess the rest are shy. Shy, maybe. I "lurk" without posting for a lonnnng time on most forums until I get a sense of how things go in that community. "Think before you speak," Papa always says. Besides, it's always best to gather intelligence before launching an invasion, lol! New record 1104 guests @ 12:46am 08/01/11.